Once I have these put together, I think I'm going to add some words above and below. I also have a few ideas of what I want to quilt in the negative space in the center. Now I just need to execute what I envision in my head. I love your center block! It's been so great to see all the heart quilts! Good luck with your goal this month! I really like this quilt and how you've done the centre. 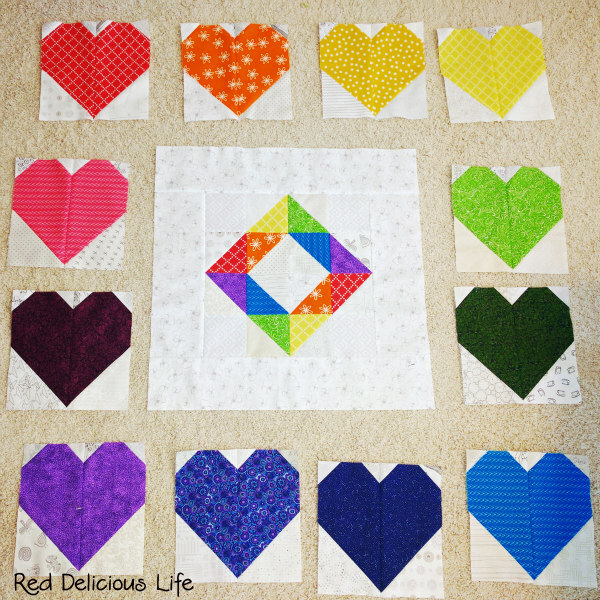 Your Pulse quilt will be a winner! Best of luck. I do like what you have so far. Good luck with your goal. Love what you have done so far. Enjoy your vacation. I look forward to seeing this come together; whether it meets your July goal or not. Beautiful so far!! The centre block looks brilliant and really pulls me into the quilt! That is going to be one happy bright quilt. Found you on the July OMG. Best of luck finishing that wonderful rainbowy beauty! I enjoyed looking at your Finishes too. They are beautiful!! I like those bright hearts and the medallion style layout! Looking good!